By the winter of 1944 the US 4th Armored Division had distinguished itself through a number of actions in France ranging from Operation Cobra in July and the Battle of Arracourt in September all the way through various engagements heading east toward the French-German border. 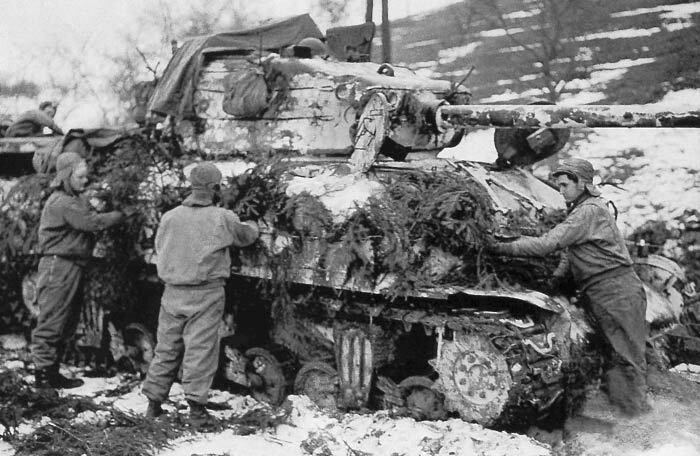 Battleworn and bogged down in the wet winter slush of eastern France, the 4th Armored lumbered to the outskirts of Singling, Lorraine on December 6th, 1944. As part of the defensive Maginot Line, a hasty attack was thrown together to take the farm town with a small force of tanks and infantry. Finding themselves caught up fighting superior elements from the German 11th Panzer Division between the cottages and tight roads of the village, the day’s battle eventually fell to a stalemate and the 4th Armored pulled back. In the coming days, a hail of American artillery and subsequent ground force attacks eventually took Sibling. The WWPD site has a handy Flames of War scenario available for the action at Singling called Abrams’ Folly. 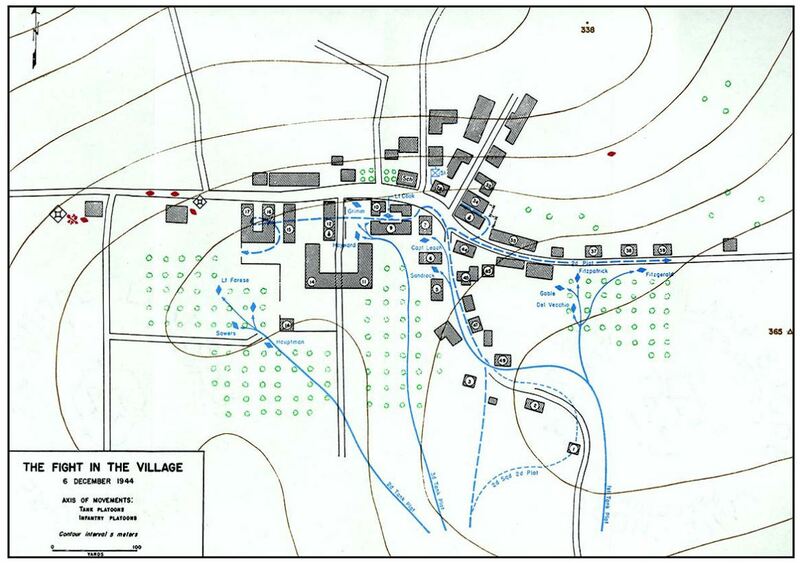 In addition, there’s some other gaming-freindly write-ups available online as well as some great historical documentation (including maps and photos) on the battle at Singling. Before heading off to an annual family vacation to Cape Cod, I had a chance to try my hand as the Americans in the Sibling scenario this past Wednesday evening at Metropolitan Wargamers in Brooklyn. Each of us fielded 2500 points, sticking as close to possible with the forces outlined in the scenario. 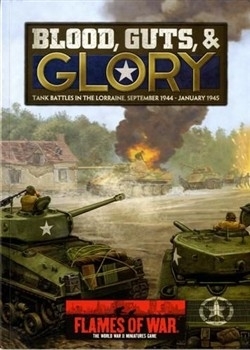 I used the Blood, Guts and Glory book which focuses on the armor-heavy battles in this region of France in late 1944 through early 1945. My force featured a mix of 75mm and 76mm Shermans, some tank destroyers, two armored rifle platoons and an off-table 105mm Priest battery. My German opponent started with a Panzer IV platoon, a Jagdpanther platoon, an 10.5cm leFH18 battery, a platoon of Pak 40s and a couple infantry platoons. As it was historically, the Americans were clearly in for a tough fight. In December ’44, the US entered Sibling from the south but the scenario places the American point of entry at the western edge of the table. The Germans deployed first with infantry and Jagdpanthers in the town, the Panzer IVs to the northwest and the Pak 40s in prepared positions to the southwest. The artillery battery was positioned to the northeast of town with spotters stationed in the church belfry and the attic of a house near the town center. 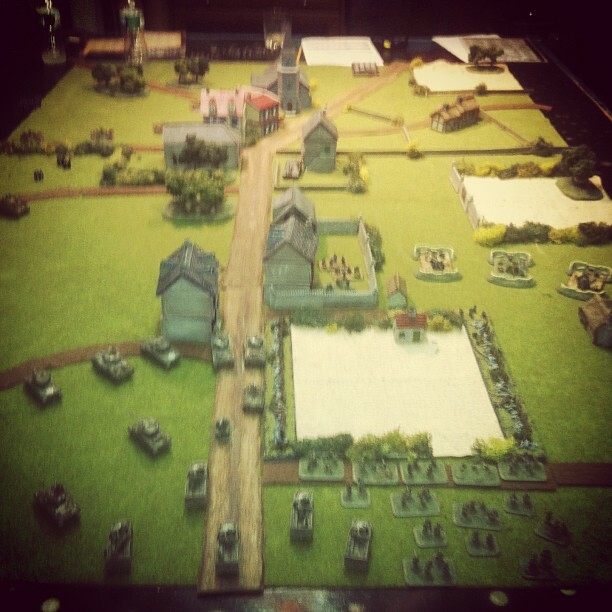 With the first turn, the Americans rolled in around the main road to the west. Seeing the Pak 40s, all the armor rolled north toward the Panzer IVs parked around and behind a small copse of trees. Infantry platoons made way for the center and the orchard just south of the road. My US plan was to avoid the killing alley of the main road while the infantry would swoop toward an assault on the infantry and Pak 40s to the south and the armor would rumble to the north toward the German tanks. The US 76s made quick work of the Panzer IVs in the first two turns and then turned toward the center of town. 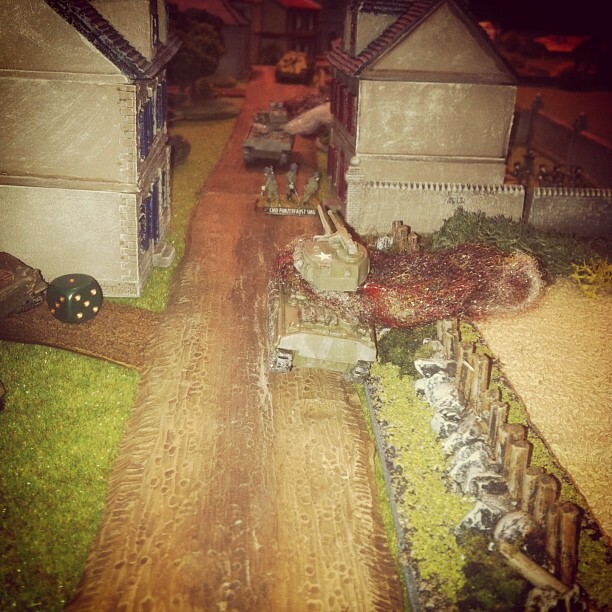 The Jagdpanthers crept out from behind buildings and took a few a shots down the road, eliminating a Sherman. 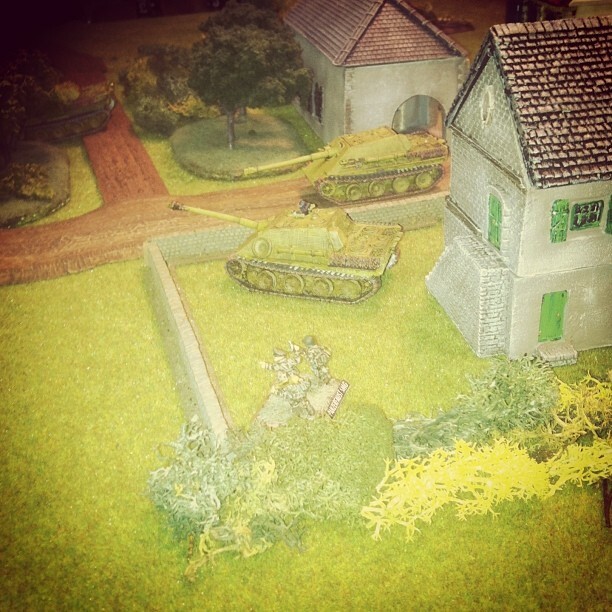 A German platoon camped out in a house at the western edge of town made a misbegotten attempt at an assault on the Shermans, bailing two with Panzerfaust fire but ultimately running off when faced with return attacks from the US armor. Another Panzerfaust-wielding squad popped out from an adjacent cottage and destroyed another Sherman with a quick rear shot before being machine-gunned down. By the end of the third turn, the northwest area of the table was a snarl of burning German tanks and shaken but advancing US Shermans. To the south of the road, a stalemate which would run the whole game commenced. The Priest battery struggled to range in and hit the Pak 40s on every turn, proving to be a complete waste of points. The American armored infantry platoons to the south of the road spent most of the game being pinned by German sniper fire and artillery barages, all the while struggling to progress through the orchard. Not until the fourth turn of the game did the American infantry truly get in the fight, exchanging fire with two nearby platoons of Germans but losing nearly half their number to fire from the Pak 40s and German heavy machine guns. In turn four, things got bad for the Germans. 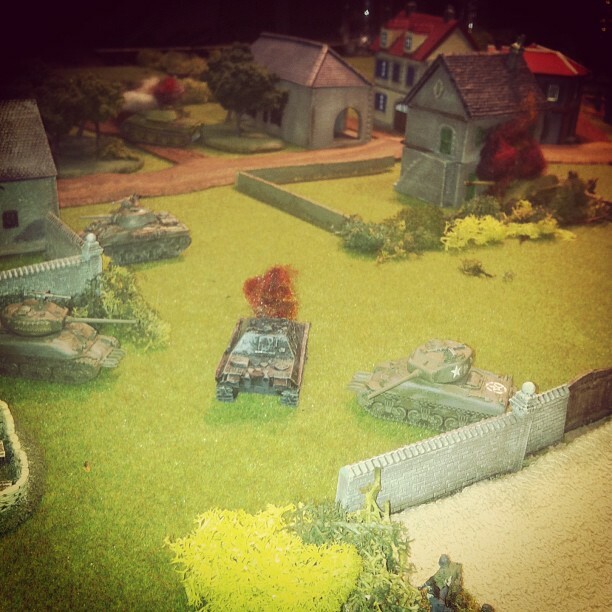 After littering the field north of town with charred wrecks of US armor, several American tanks broke to the middle of town toward the three remaining Jagdpanthers. A near-certain side blast to one Jagdpanther glanced off with no effect, but then an extremely lucky shot from a US 76 destroyed the Jagdpanther command tank. While the Germans scrambled to appoint a new command tank, the Americans ganged up to destroy one of the two remaining Jagdpanthers. 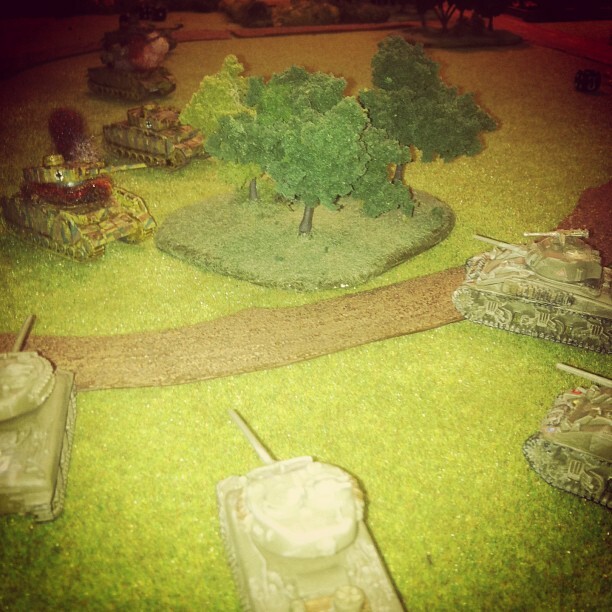 With the platoon reduced to just one remaining tank, the German player rolled and failed a morale check and the last tank fled the center of town. With the center of town secured, all German armor destroyed, a stalled infantry firefight to the southwest and the American tanks advancing to the German artillery battery, the game was called at the fifth turn. I was honestly surprised by the American victory, upsetting the historic outcome of the battle. We stood around for some after-action what-ifs for both sides while packing up the table, and clearly there could be improvements in choices of forces and tactics the next time we head back to Singling.